This is a picture of my fish room. 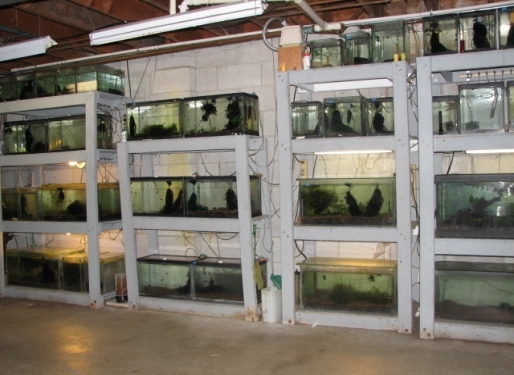 It is along one wall in the basement, and consists of 40 tanks. These range from 2 1/2 gallons up to a 40 gallon community tank. Most of the tanks are dedicated to killifish, otherwise know as Cyprinodontidae, or egg laying tooth carps. Killifish species are native to every continent except Australia and Antarctica. We even have some native killifish here in Wisconsin. Unfortunately the prettiest one is endangered and can not be collected. Many kilies are among the most colorful of the freshwater fish, yet are rarely found in pet shops. The best way to obtain them is to find others who breed and raise them. More information on these beautiful fish can be found at the AKA website. Because killies tend to be relatively small, usually in the 2"-3" range, and are relatively inactive, they can usually be kept in small tanks. A pair of most species will do well in a 2 1/2 gallon. Thus, most of my tanks are 10 gallons or smaller. Some of them are home made from plate glass and silicon cement. A few of them were made in the late1960's and are still holding up well. Although it is not the most efficient way, each tank has its own heater. This is not too bad since most killifish do well at lower temperatures than most tropical fish. A temperature of 70º-72º F is fine for a majority of species, and some actually prefer it cooler. These are kept in tanks on the lower level without heaters. Many species live in forested areas so the lighting on many of my tanks is not especially bright. This limits the type of plants that will grow. Java moss grows in the darker ones. Anubias, hornwort and Najas grass reside in the ones that have more light. About half of the tanks have gravel and under gravel filters. The rest are bare and have sponge or box filters. A single Jehmco linear piston pump provides more than enough air and is nearly silent. The output of the pump goes to the middle of 1" diameter PVC pipe manifold that runs along the top of the tanks stands. Air is tapped off through brass tubing that is inserted into holes in the PVC and sealed with silicon cement. Standard aquarium air tubing goes from the manifold to adjustable gang valves which feed the individual filters. Most of my tanks are dedicated to killifish. My favorite is Aphyosemion elberti, especially the N'Tui strain. I try to keep a variety of other species including Epiplaytus, Procatopus, Fundulopanchax, Nothobranchius, Rivulus and others. My goal is to breed my killifish and raise the young. Most of the ones I keep are plant spawners. They lay their eggs in mops made from nylon yarn. I pick the eggs and put them in small plastic containers. Most take 2-3 weeks to hatch. Other types are known as annuals. In the wild they lay their eggs in the mud. The pond dries up and the adults die. When the rainy season returns, the ponds fill up with water and the eggs hatch. In the aquarium the fish breed in containers of peat moss. The peat is removed and allowed to dry out for the 2-3 months most take to hatch. I keep my incubating killifish eggs in a home made incubator until they are ready to hatch. Once they hatch I put most types in a continuous flow fry system. This gets them off to a fast start. 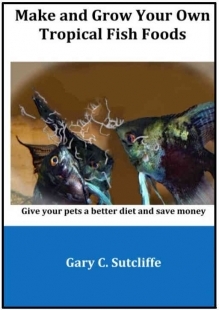 I recently wrote a book on making and raising food for your fish. It covers food from the kitchen your fish will eat plus over a dozen different live foods you can culture. Not only will your fish look and grow better, be more likely to breed, but you will also save money in the process. Click on the image to the right for more information. If you live in Wisconsin or northern Illinois and have an interest in killifish, please check out WAKO. Aquarium fish love live foods. They grow faster and breed more often if they are fed live foods. Here are instructions for raising some of the more common tropical fish live foods.